For over thirty-seven years, Richard Sweat, was not only a fine lawyer, but also one of San Diego’s great civic leaders known for his integrity, ethics, wisdom and wit. After graduating from Ohio Wesleyan in 1965, Mr. Sweat went on to earn his Juris Doctor from the University of Illinois in 1968. In 1969 he moved to San Diego and practiced law for seven years before joining with his partners to form Post Kirby Noonan & Sweat LLP – now known as Kirby Noonan Lance & Hoge LLP. Universally known as a “great guy”, Mr. 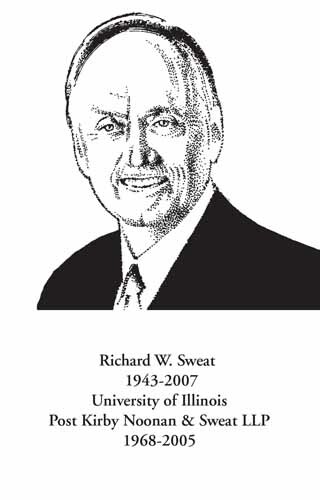 Sweat was an accomplished attorney who quickly earned the respect of his colleagues and clients. His practice focused on business, corporate and real estate transactions, estate planning and ownership services for closely held businesses with clients including corporations, limited liability companies, trusts, general and limited partnerships and their owners and managers. Mr. Sweat was committed to the community and well-being of San Diego which was evident in his numerous volunteer positions. After receiving the United Way of San Diego’s John V. Naish Award for distinguished service, Mr. Sweat served on their Board and ultimately became Chair. He was President of the Combined Health Agencies of San Diego and President of the American Lung Association. Mr. Sweat also served as a lecturer in Business Organizations at California Western School of Law for 1977-1978 and was a lecturer and moderator at the Continuing Education of the Bar on business law issues for which he often testified as an expert witness. Mr. Sweat is survived by his wife, Kasey, two daughters, Lara and Stephanie, and three sons, Jeffrey, Stephen and Brian, as well as and two grandchildren.